Every year the Orange Audubon Society conducts the Kit & Sidney Chertok Florida Native Nature Photography Contest. The contest is named for the Chertoks who moved to Orlando in 1985. Sidney Chertok had numerous skills and interests during his life, being an electrical engineer, patent holder, director of information services and also advertising and promotion for Sprague Electric Company. He was also a reporter and photographer, with a particular interest in nature subjects. Mr. Chertok edited a photo-filled calendar for 34 years featuring images solicited by competition. Kit Chertok, an Orange Audubon board member in the 1990's, was instrumental in establishing this photo contest in her husband's memory to encourage nature photography in others. The contest mission statement reads: "To promote interest and concern for preserving the native fauna and flora of Florida, and to encourage nature photography and enjoyment and appreciation of our natural wonders." Participants in the contest include Audubon members and others interested in nature photography, with separate categories for youth, novice & advanced photographers since 2011. Previously the categories changed from year to year, usually separated by subject matter. Orange Audubon serves the Orlando area and submitted photos are from throughout Florida. I won my first Chertok award in 2007 for the image "Don't Mess With My Chicks" (see my March "Great Horned Owls" blog post for more about that image), which placed third in the Florida's Birds! category. I took two awards in 2009, with "Heading Out to Sea" of a loggerhead sea turtle hatching winning first place in the Beyond Birds! 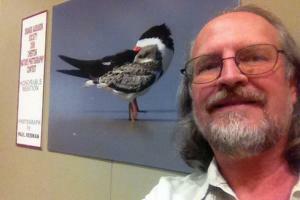 category and the Black Skimmers adult and chick image titled "Homer & Bart" (shown here in my 'selfie' with a big print on display at this year's awards ceremony) receiving an honorable mention in Florida's Avian Wonders!. In 2009 my extreme close-up of "Small Butterwort" won an honorable mention in the category Florida Invertebrates and/or Wildflowers. My "Pine Lily and Pines" from Tiger Bay State Forest earned and honorable mention in the 2012 Chertok contest Advanced class. This year (2014) I was asked to be one of the judges for the 26th annual contest. The other judges were Marina Scarr, photographer and Carolyn A. Cohen, watercolors and etchings artist. In 2013 Marina won both first and second place in the advanced category of this contest and in 2012 took third place. The winners were announced Thursday evening, June 19 at an awards dinner at Leu Gardens. After the contest committee had culled out the disqualified entries (images cannot contain humans, human structures or artifacts or non-natives), the three of us spent most of a Sunday viewing the over 350 entries and selecting those worthy of the top three awards in each category, plus honorable mentions. We were particularly impressed by a number of the entries in the youth category, several expressing some 'out-of-the-box' thinking that produced some successful results. The 2014 winners can be viewed, along with winners from previous years at Orange Audubon's website. 2018 Update: "Bee Fly on Roseling" won Honorable Mention in the Orange Audubon Society's 2018 (30th Annual) Kit and Sidney Chertok Florida Native Nature Photography Contest. The image shows an extreme close-up of a Poecilognathus bee fly on an endemic Florida scrub roseling flower. Also, my photograph of a Golden-silk Spider hanging from her web won Honorable Mention in the Advanced category of Orange Audubon Society's 2015 Chertok Nature Photography contest.